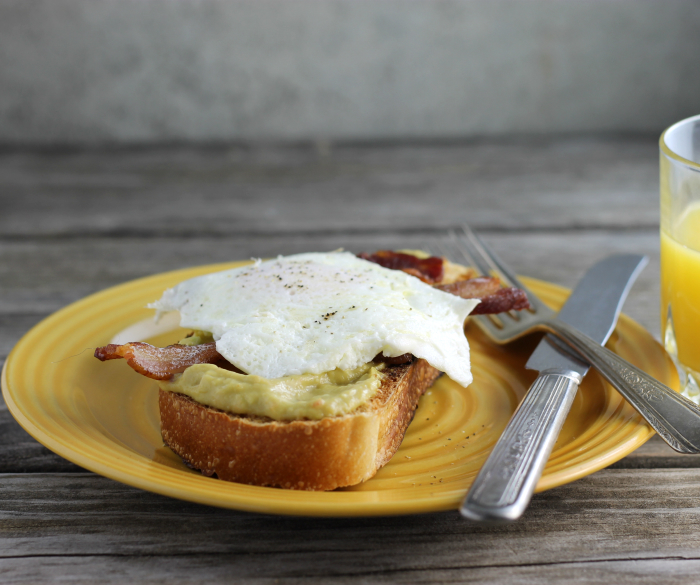 Toast smeared with creamy avocado and topped with slices of bacon and an egg. 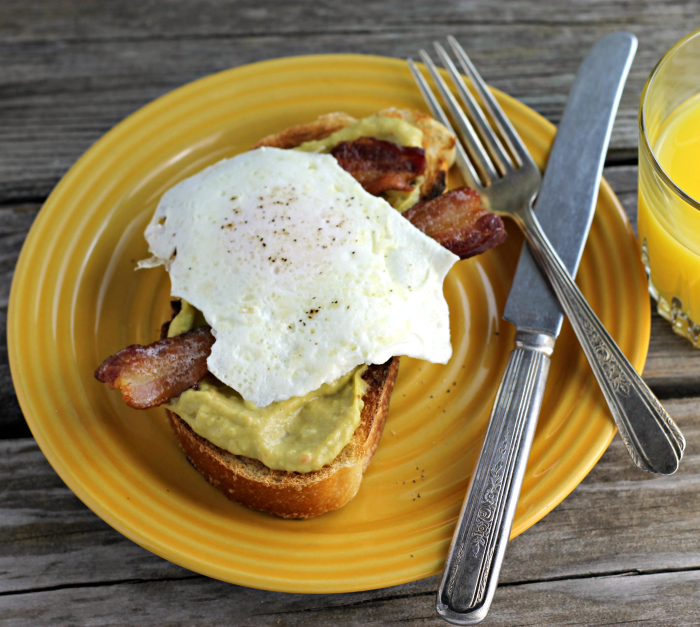 Avocado toast with bacon and egg is a yummy way to start your day. A few years ago I ran into a classmate of mine at the fruit market. I remember there was a huge avocado sale going on at the time. My classmate was loading up on the avocados. She said that she adored avocado toast in the morning and was so excited for this sale. At the time, I was a little puzzled by what she said. I had never heard of avocado toast (I know, sometimes I think I live under a rock) and didn’t know if avocados and toast were things that should be eaten together. Avocados were for guacamole. Since that time of when I ran into my classmate, my taste for avocados has expanded. So I say… yes, please to avocado and toast these days. For this recipe, I blended avocado with onion, tomato, and garlic for a bit more flavor. I processed the avocado so that it was creamy, like a spread, but if you prefer you can process the avocado a little less for a chunky texture. 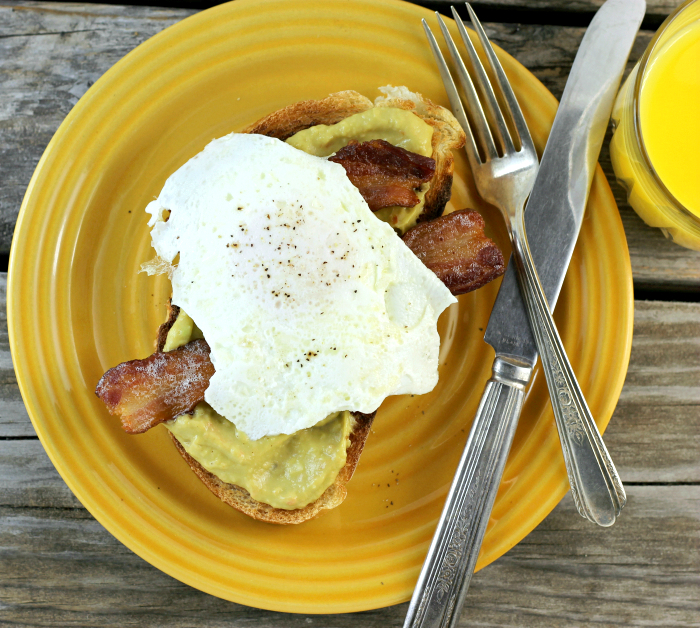 The saltiness of the bacon and runny yolk of the egg made a great addition to the avocado toast. I think I will be saying yes please quite often for this avocado toast with bacon and egg. Remove the flesh of the avocado and add to a mini food processor. To this add the onion, tomato, garlic, and a dash of salt. Process the mixture to your liking. Prepare the bacon, eggs, and toast. Once the bread is toasted spread it with the avocado mixture, top with the bacon and egg. 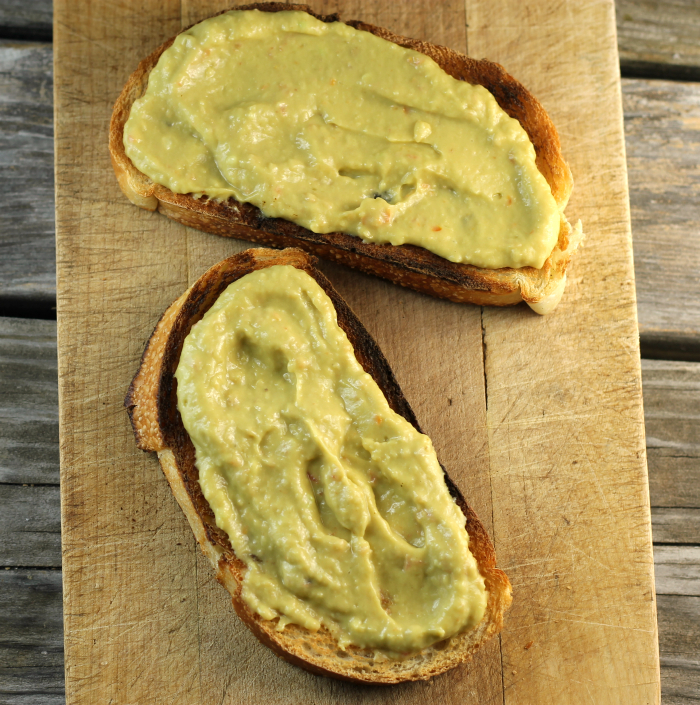 I love avocado on toast, such a great breakfast to get you set up for the day. I eat avocado toast nearly every morning. But now I’ll be craving it topped with bacon and eggs!!! YUM! I need to experience this, I must have been living under that rock with you Dawn! I’ve heard of avocado toast, but I’ve yet to try it myself. It’s all the rage in the fancy restaurants, so clearly I must have been living with my head in the sand lately. Either way, this sounds like an incredible comfort-food breakfast! Thanks for the recipe, Dawn! Yup, I’m under that rock too! Sounds like a fun idea — gotta try this. Thanks! How come I never thought in spreading avocado in toast? Thanks for the inspiration…looks delicious Dawn. A great way to start the day. This is my kind of breakfast! Healthy and yum!